Many chemical, biochemical, and biological degradation processes follow first-order kinetics, which is characterized by a single exponential rate constant. In this Demonstration, we evaluate the possibility that the same experimental data can also be fitted with a general fixed-order kinetic model or with the stretched exponential (Weibull) model with , which implies either a different order or nonlinear kinetics. This is done by generating data using the first-order kinetics model, with and without added random scatter of a chosen amplitude. The data is then fitted to these alternative models, varying the value of . It is shown that there might be numerous situations in which first-order kinetics and the two alternative models with give indistinguishable results. A degradation reaction kinetics order is defined by the differential equation , where is the concentration at time and is the rate constant with dimensions and units commensurate with . The boundary condition is , the initial concentration. For first-order kinetics with , the equation's solution is , where the exponential rate constant has units of reciprocal time. For the rate equation's solution is . Theoretically, this solution allows for negative concentration values for certain times when and complex numbers for certain times when . Replacing these unrealistic values by zero gives a generalized fixed-order kinetics model for , which for assumes the form . 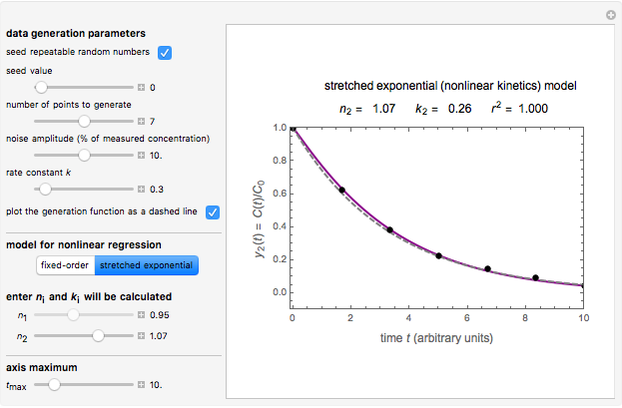 A common model for nonlinear kinetics is the stretched exponential (Weibull) model, of which the first-order is a special case. For our purpose it can be written in the form . This model with was shown to be useful in predicting nutrient loss under non-isothermal conditions where, traditionally, first-order kinetics has been used [2, 3]. 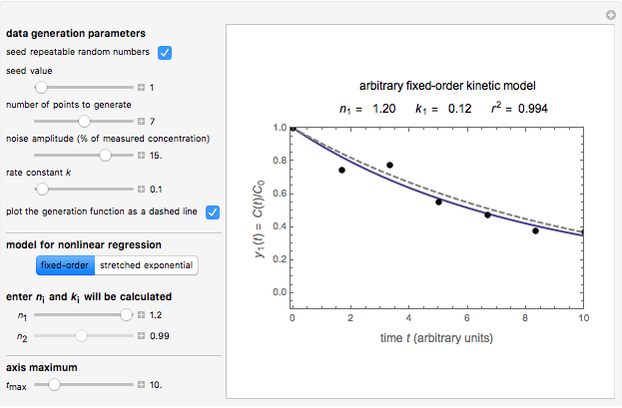 In this Demonstration, you can examine the fit of the three models by generating degradation data with the first-order kinetics model , with or without added random noise, and fitting them by the two other models and using nonlinear regression. The model is chosen with a setter bar. 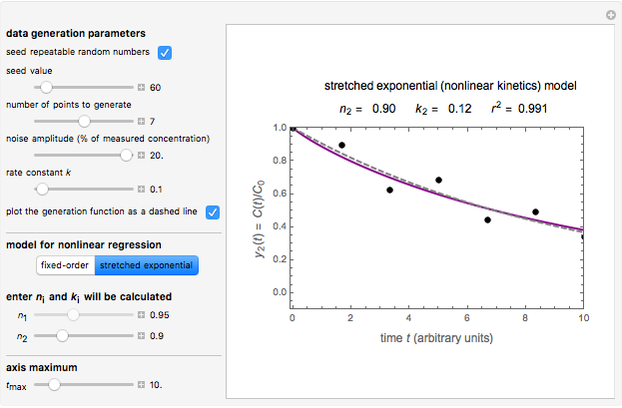 The seed, number of data points, value for their generation, the scatter's amplitude, and the or in and are entered with sliders, as is the maximum of the time axis. By clicking the checkbox, you can select a repeatable seed and choose or decline to plot the generated curve as a dashed curve before the added noise. The Demonstration plots the generated data points on which the fitted curve is superimposed as a solid curve. It also displays the chosen or , calculated or , and the fit's -squared value. It shows that with the values of and within the range of 0.8 to 1.2, there can be multiple combinations of the parameters in which the models have a similar fit, as judged by statistical criteria. This suggests that data fit alone might not be sufficient to establish first-order kinetics. M. G. Corradini and M. Peleg, "Prediction of Vitamins Loss during Non-isothermal Heat Processes and Storage with Non-linear Kinetic Models," Trends in Food Science & Technology, 17(1), 2006 pp. 24–34. doi:10.1016/j.tifs.2005.09.004. Mark D. Normandand Micha Peleg "Fit of First-Order Kinetic Model in Degradation Processes"